Many, many years ago, before fast food, bookkeepers and paper currency, several tribes of humans dwelt in a long, lush valley. The weather was fair and the Gods benign, so they lived simply and happily. At the north end of this valley dwelt a lovely girl named Victoria, who lived on a small plot of land in the desirable hub, near the wealthy marketplace. On this land was a peach tree, which produced no more and no less than 25 baskets of peaches every year. A certain status came with owning the only peach tree at the north end of the valley, and Victoria enjoyed it very much. She needed only 1 basket of peaches for herself each year, and she was able to trade 10 more for the other food she required, such as chicken, which was plentiful in the valley, plus vegetables and bread. Her small house required little maintenance and fuel, and she was able to maintain it for the cost of 4 baskets of peaches per year. This left her with a quite a lot of disposable peaches. The north end was somewhat cooler than the rest of the valley, so the inhabitants wore more furs than the others. Each fall, the trappers came through with their wares, and Victoria would trade 5 baskets of peaches for a few sensible items, which she had made into fashionable winter wear. One day, a man from the flats in the central valley came up north and brought with him the strangest meat – steak. He shared it with everyone at the communal fire on Sunday, where they all gathered each week to eat together, play music and dance. The feast was fine that day as the people of the northern valley discovered the delicacy later to be known as Filet Mignon. Victoria fell instantly in love with steak, and from that day forward she had steak every Sunday, as did most of the northern inhabitants. Unfortunately, steak was very expensive, and she found herself spending an extra 5 baskets of peaches per year on it. Oh well, she thought, everyone else is eating it and I love it so much. I work hard to maintain my peach tree. I deserve to have steak on Sundays. When the fall came that year, everyone gathered up a portion of their goods to present to the Chieftain. This was to pay for his governance, the medicine man, the yak tracks and the communal fire. Her portion was 3 baskets of peaches per year, but when she arrived at her store room, it was empty. She had spent all of her peaches! Desperately, she ran to Gawain, the goofy chicken boy, and begged him to give her some chickens to bring to the Chieftain instead of peaches. Gawain was goofy, not stupid, and though he smelled like chicken poop, he liked peaches very much, so he bargained with her. He would give her the equivalent of the 3 baskets of peaches in chickens, but when her tree again bore fruit, she would give him 4 baskets in return. Grateful and relieved, Victoria accepted the bargain and brought the chickens to the Chieftain. He was grouchy that he wasn’t getting peaches this year, but accepted her submission and her taxes were paid. The following year, when the tree again bore fruit, Victoria took 4 baskets of fruit to Gawain, who had lost another tooth and was looking uglier and goofier than ever. She ate 1 basket herself, then paid her 10 baskets to the various food sellers, and spent 4 more maintaining her house. By the time she bought her Sunday steaks for 5 baskets, she was in a bind – she was, once again, short for the Chieftain, plus she had no peaches left for her winter furs. So, she went back to Gawain, who was prospering rather nicely on his prolific chickens. She knew the Chieftain would have to get at least some peaches this year, so she bargained with Gawain for chickens to buy her furs and to make up the extra baskets for the Chieftain, for a total, with interest, of 9 baskets of peaches to be paid in the following harvest. The following year, Victoria had a problem. She couldn’t live and give Gawain all 9 baskets she owed him, so she bargained with him again to accept 4, and she would add 1 extra basket next year. She then cut her house maintenance down to 3 baskets, her food to 8 baskets, furs to 4 baskets and begged the Chieftain to allow her to pay him only 2 baskets this year, based on her poverty. The Chieftain allowed it, but made it clear that he would require extra baskets once she got back on her feet. The next year, blight hit her peach tree, and the Chieftain, tired of her whining, married her off to Gawain, who lived happily ever after on her peaches and his chickens. At the south end of this valley dwelt a lovely girl named Persephone, who lived on a small plot of land in the gentle farming district, far from the marketplace. On this land was a peach tree, which produced no more and no less than 25 baskets of peaches every year. Persephone lived with the joy and the sadness of having once loved a man deeply and having lost him, but the tragic yak incident had not taken her lovely daughter, Tonya. Each year, Persephone and Tonya consumed 2 baskets of peaches themselves, and then traded 8 more for other food. Persephone maintained a small vegetable garden, so they didn’t need to trade for all that much food. Their house was slightly larger than others in the area, so they required 5 baskets for fuel and maintenance, and the furs for the young mother and growing child came to 4 baskets each fall. One Sunday night at the communal fire of the south end, a man from the central valley was handing out morsels of a lovely new thing called ‘steak.’ Persephone and little Tonya each tried it, and they found it wonderful. The beef man, who loved peaches, told them he would give them a special deal: 5 baskets of peaches for steak every Sunday for a year. Persephone and Tonya discussed it, and agreed to one basket every year for steak one Sunday per month. After paying the Chieftain his 3 baskets of peaches, this left them with two baskets of peaches that year that were not spoken for. Tonya implored her mother to buy more steak and better furs, but Persephone just laughed. ‘I have plans for those peaches,’ she replied. That year, she traded one extra basket of peaches for the rare glittery stones that the Rich People of the north valley liked so much. 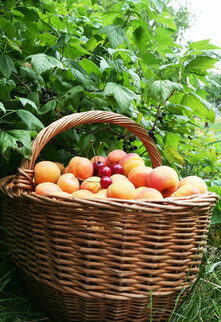 The other basket was used for seedlings, and she managed to plant three more peach trees on her little plot. The next year at the Sunday fire, where many people had steak every Sunday, some families took pity on Persephone and Tonya. They had watched the young mother maintaining the peach tree with a baby on her back, then later little Tonya helping her with the hard work. Persephone tried to look serious as she said, ‘Thank you, you’re very generous. We’re happy with our chicken.’ Tonya burst out laughing. That year, the house was in good repair and the weather was fine, so maintaining and fuelling the house cost only 4 baskets. They ate 2 baskets of peaches, traded 8 more for food, purchased their furs for 4, bought their monthly steak for 1 and presented the Chieftain with his 3 baskets. Once again, Persephone used a basket for planting and got 3 more new seedlings for her growing orchard. This time, Tonya did not laugh out loud as she didn’t want to disrespect the Chieftain, but waited until her mother had gracefully refused the Chieftain’s kindness and they were alone at home. Then they had a good laugh. Life was good, they wanted for nothing, and they certainly didn’t feel the need for charity from anyone. At the end of the year, they had 3 baskets of peaches left, and Persephone tried a difficult and chancy experiment. An ancient recipe for firewater made of peaches had been handed down to her, and she decided to risk it. The following year, the peach schnapps was a success, and the 2 extra baskets of peaches were traded for the equivalent of 4. The year after that, the first blossoms were seen on the new seedlings, and Persephone was able to sell them as decorations for weddings and other events, since the trees were too young to bear fruit. She also sold more apricot firewater, and she and Tonya were now receiving the equivalent income of 40 baskets of peaches instead of 25. Of the extra baskets, Persephone traded 7 of them for the precious stones that the rich people of the north liked so much, she added 2 baskets to their trade for furs, and then used the rest to plant more trees and make more firewater for future seasons. By the time Tonya was grown, their orchard had swelled to twenty trees, each one bearing no more and no less than 25 baskets of peaches, and they purchased the neighbouring plot of land to expand even further. Tonya, having grown up independent, sensible and proud, married the Chieftain’s handsome son. Persephone hired a handsome orchard boy, and they all lived happily ever after.